Below, you will find a Q&A that addresses concerns such as what is measles and how does measles spread. 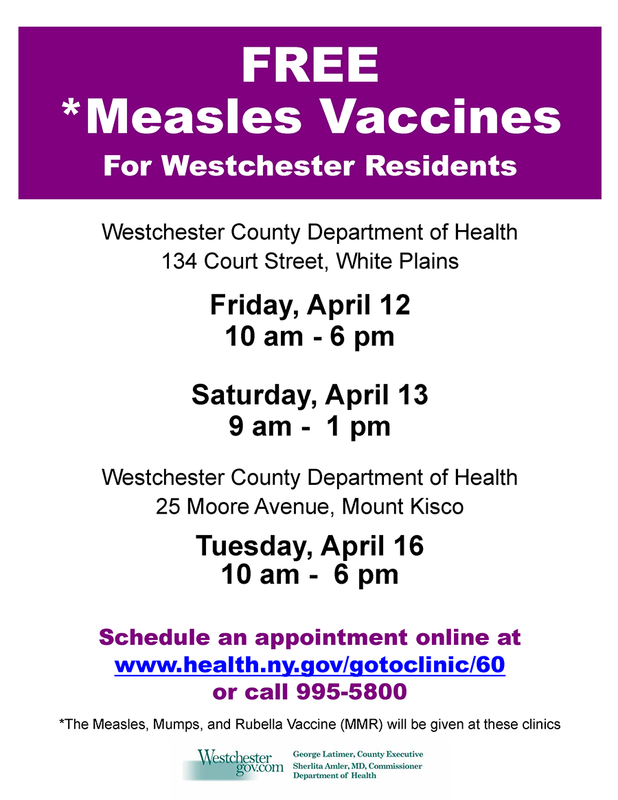 In addition, there is information about when and where to get a free measles (MMR) vaccination in the coming days. Eight unvaccinated children in northern Westchester have been diagnosed with measles. They do not attend public schools or daycare programs. Measles is so contagious that when exposed nine of ten people who are not immune will also become sick from the virus. Children 6 months through 11 months of age should get an MMR vaccine now to help give​ them some protection against measles. They will still have to get a vaccine at 12-15​ months of age and again at 4-6 years of age. Children 1 through 3 years of age who have already received their first MMR vaccine​ should get a second MMR vaccine now, as long as 28 days have passed since the first​ MMR vaccine was given to them. Getting MMR vaccine is much safer than getting measles, mumps or rubella. Most children who get the MMR vaccine have no side effects, and most people who get it do not have any serious problems with it. The side effects that do occur are usually very mild, such as a fever, rash, soreness or swelling where the shot was given, or temporary pain and stiffness in the joints, mostly in teens and adults. If I'm not sure of my vaccine status, is it safe for me to go out in public? If you are not vaccinated, you are at greater risk of getting sick if you have been exposed to someone with measles. Those who are unaware of their status and unable to get their vaccination records should get an MMR, as it is not harmful to receive additional doses. The MMR vaccine contains live, weakened virus, which protects you from measles by triggering your body’s response to the virus. People with immunocompromised conditions should speak with their doctor/medical provider. Immediately call your doctor and let him or her know about your symptoms. Anyone who suspects they may have measles should not show up at a health care facility unannounced. Call your doctor if you are concerned about your symptoms.